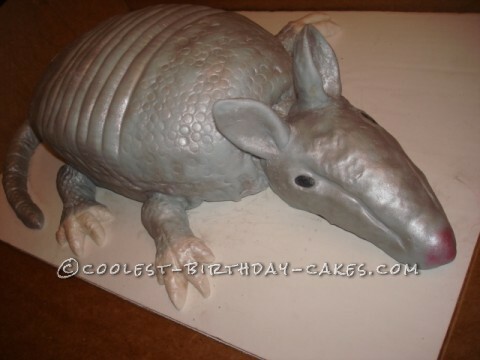 This Armadillo Birthday Cake is my first fondant covered cake. I took white fondant and threw in a tiny bit of black fondant for the color. I then used silver petal dust to cover to get the shine. The feet, tail, and head were made with rice krispie treats, the eyes black fondant, nose petal dust. The parts made from rice krispie treats were made in advance. Of course the inside of the cake was red velvet. I used the wide side of a decorating tip to make the scales. The cake was made from a 9 x 13 and then a football shaped cake on top, then carved to the shape you see. The feet, tail, and head were attached using dowel rods (I use chopsticks from chinese take out). In hindsight the head was too long (the angle in the photo exaggerates the head somewhat), but other than that I was pleased with the overall cake. Most importantly the birthday girl and her Mom LOVED it. It was truly the hit of the party.